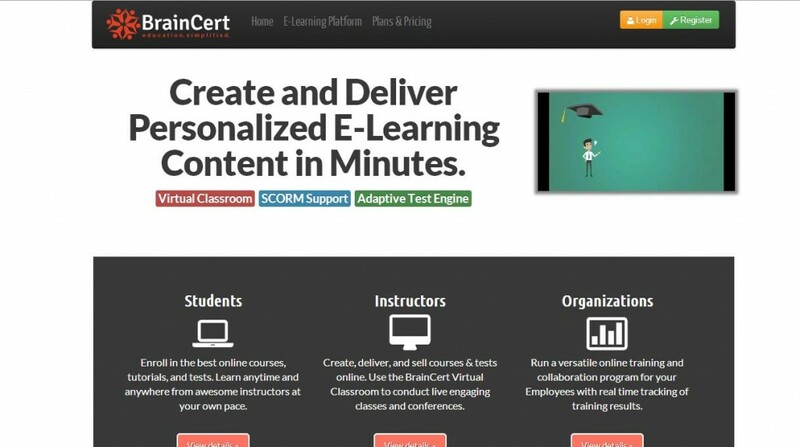 BrainCert.com is evolving into a user-driven e-learning center on the web. Started in the year 2000, BrainCert is an e-learning platform connecting people to world-class education. After going through several changes over the years, BrainCert perfected its state-of-the-art online Test Engine technology. In 2007, BrainCert was revamped into a more sophisticated e-learning platform to meet the demanding needs of modern education. Today, BrainCert has accomplished its goal of providing exceptional educational solutions by creating a comprehensive set of educational tools that allows creating and delivering personalized e-learning content easily. BrainCert is the Easiest Way to Learn, Teach, and Collaborate Online. Online Courses Offering the most powerful course creation tools, BrainCert helps you create, manage and publish the courses in just a few clicks. SCORM 1.2, and 2004 4th edition content packages can be imported in a course easily. Content & Media Publishing BrainCert Content Engine helps publish public and private content from virtually anywhere on the internet. Upload your contents with ease and let BrainCert handle the mess of uploading and converting your files in to an online courseware. BrainCert Classroom Engine is a cloud based high performance software that provides a collaborative and interactive virtual learning experience to conduct live engaging classes, online meetings and conferences easily. BrainCert’s Adaptive Test Engine helps create and deliver highly-professional, advanced and feature-rich online tests, assessments and quizzes. Catering to the diverse needs of e-learners, the versatile BrainCert platform is tailor-made to deliver cost-effective online learning programs to audiences anywhere. Upload your contents with ease and let BrainCert handle the mess of uploading and converting your files in to an online courseware. BrainCert is introducing a mechansim that gives users the opportunity to market their skills by offering courses using BrainCert’s learning system. If you are good at something and you believe you can find an audience who will want to pay to learn something new using BrainCert, then you can join braincert and start your teaching courses and get paid 90% of the proceedings. BrainCert is planning to be the ultimate hub for educators and learners to meet and exchange knowledge using BrainCert’s state of the art e-learining platform.